For information about these unions and links to their websites, please see the TUC website. 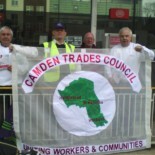 It is not possible to join Camden Trades Council as an individual member. Membership is through affiliation which is open to any trade union branch with members working or living in Camden. The affiliation fee depends on the number of local members in the branch. We can be contacted by phone via the Camden Unison office on 020 7974 1633.